During this week's heatwave, a Cornetto no longer cuts it. 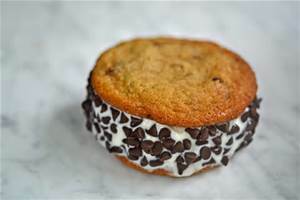 The new trend is for gelato sandwiches - an Italian-style soft ice cream served between two cookies, slices of brioche or waffles. In London, Selfridges are selling ice-cream sarnies by the upmarket Snowflake brand for £4.50 each. But if you don't want to shell out, they are easy to recreate at home. Shop-bought cookies work as well as brioche, but be sure to choose crispier ones. And briefly churning the ice cream in a food processor makes it easier to handle, if you don't make your own gelato, as I do. 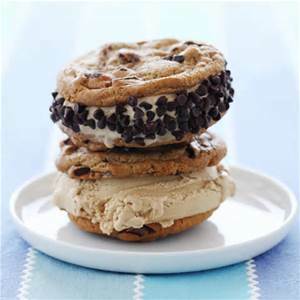 Smear ice-cream on one cookie and press another cookie on top before freezing for 15 minutes. 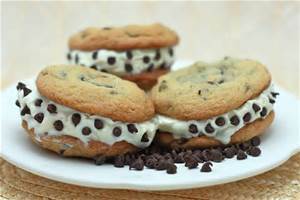 Vanilla ice cream and chocolate chip cookies or pistachio cookies with chocolate ice cream are the best combinations. Go on try an ice-cream sarnie for lunch today!